Sippican Cottage: Do Flowers Grow On Pork Chop Hill? Do Flowers Grow On Pork Chop Hill? He gazes out of the photo, mute, enigmatic, not quite smiling, and speaks to me across the decades. When I was a little boy, amusements were few and far between. Television was still in black and white for us, and after the reruns of Gilligan's Island and The Three Stooges, not much was on the idiot box, as my father called it. I remember my father and me trying to watch a hockey game broadcast from the west coast featuring the California Golden Seals, who were setting a new low in sports sumptuary and getting pasted by our mighty Boston Bruins -- Bobby Orr and Phil Esposito and Pie McKenzie and... well, I can still recite all their names down to the most obscure, even Garnet (Ace to his friends)Bailey. On a thirteen inch black and white TV with rabbit ears. We might as well have used the Etch-a-Sketch. Eisenhower's X-Box, the Etch-a-Sketch was. And so it always seemed a real treat when we could wheedle our mother to drag out the elegant but battered silverware box, left from some set our family never owned, filled with the family photographs. The pictures were mostly black and white too, the current cutting edge of photography being Polaroid's prehistoric b&w instant photos. They'd come out of the camera, and you'd count to a now forgotten tempo, and pray, and pull off the cover paper to expose the image and stop the developer, and smear your clothes, and hope the picture was vaguely done. We'd see the usual babies on the shag carpet, buns up; confirmation and communion suits that fit like either a tent or a rubber glove, never any degree in between; little girls in their Easter jumpers and patent leather shoes, with their mothers wearing a hat, a real hat, ready for church. Father, grim, unsmiling in his workday suit, a little shiny at the elbows and knees. Those photos were only the littlest bit interesting after a while, because they were for the most part, well -- us. The exotic ones were always deeper in the pile, instantly recognizable as special by that magnificent sepia tone that photos used to have, and spalling and cracking like a fresco in damp cathedral. There they'd be, the southern Italian or Irish immigrant faces, looking stoically at the camera, surrounded by extended family on a stoop in Cambridge or Dorchester or Roxbury Massachusetts, or perhaps Antigonish, Nova Scotia. They had their hard lives written all over their faces. But always calm looking. Serene, really; not introspective or egoist. And they looked into the lens in a way that we never do. Not at it, but through it. Our parents would strain to remember all the names, and who did what and from where, and why and when. And I figure, with the small wisdom that I've accumulated with age, that when we pestered them too much about someone obscure, they made stuff up. And then his face would turn up. Handsome, mysterious, forever young. Forte. That's my brother Bobby, my mother would answer. And that was that. I was young, and still in the thrall of my parents, and sensed it. Here is a place you do not go. The years passed, and the TV was in color, and my wrists and ankles began to show from my hand-me-down cousins' clothes. And the box came out less often. But when it did, the tantalizing face, handsomer than all the others, undiminished by time or care, resplendent in a uniform, always caught your eye. He died before I was born I learned, by osmosis I think, I don't remember ever having the nerve to ask, and I'm sure it wasn't offered. And the earth spun, and the seasons changed, and then I was a man. One day, my mother came to me. She had a picture. 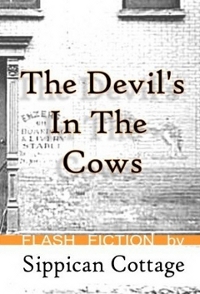 it had lain stored and untouched for fifty years, coiled, and she couldn't unroll it without destroying it. We slowly, ever so carefully unrolled it, the flecks of black and white popping off, as I stared at the faces. Hundreds and hundreds of faces. Five rows, stretching right off the page, four feet long, all in identical infantry uniforms, except the six cooks dressed all in white. C Company 506- Infantry, 101st Airborne Division. Camp Breckinridge, KY. December 27, 1952. And there was only four ways to stand out in that mob of faces. The cooks, of course. One man in the hundreds wears an officer's hat, and looks ten minutes older than the rest. One man is holding drumsticks over a military style snare drum. And in the very center, in the very front, one man holds the company colors on a lance. Two crossed muskets, a Capital "C" and a "506." And he has the face that speaks to me. Now when I was in college, on a lark, my friends and I went skydiving. We trained all day in a sweltering hangar in upstate New York amongst the farms. They strapped army surplus gear on us, hung us on straps depending from the hangar roof, and shook us around violently by our heels until we demonstrated that we could unbuckle our main chute from the straps on our shoulders, then pull the cord on our belly chute. Fun. We climbed resolutely into a DeHavilland Beaver, which now seems to me an odd name for a plane, and knelt in rows in the fuselage. A few long minutes later we launched ourselves, some with difficulty, out the open hole in the side and into a whirlwind far over the patchwork quilt of the fields. A tether pulled our chute for us, and we drifted down and found a place with a liquor license. I called my father, and told him what I had done. Expecting praise, I guess, or some such. And he called me, gently, the fool I was. I protested: but you were in a bomber plane. They must have made you jump. And he told me, son, if that plane was on fire, filled to the brim with rabid rats, and piloted by a dead man, I'd still take my chances in the plane. And to jump from a perfectly good one, he said, is foolish. Click. My father was in the Army Air Force. Ball gunner, hanging in a plastic bubble under a B-24J, Les Miserables, over the Pacific. Air Medal. Distinguished Flying Cross. After I pestered him enough, he once told me a sort of a story about the war. He reeled off the names, Tarawa. Pelelau, Kwajalein, Tinian. He mentioned, in an offhand way, that after some island had been bombed flat, they later landed on it. It looked like the island had been picked up ten feet, he said, then dropped. His CO told them that some planes were coming. On these planes were some people. They were coming from somewhere. They were going somewhere else. When the planes landed, my father and his compatriots were instructed not to talk to these men, or even about them; and if he said so much as hello to one of them, or said "boo" about them to anyone else, he would spend the remainder of the war in a military prison, incommunicado. My father lost his desire, if he had had any, to speak about those men. He surmised some of them later flew a plane named the Enola Gay. 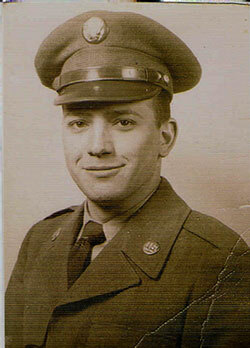 My father seldom talked much about being in the military. And my mother never talked about the brother in the photographs. Now the picture, the coiled picture, was ruined. But then, we don't watch black and white TV any more, do we? My mother took that picture, and a bankroll, and had a necromancer or an alchemist or something at a digital photography studio restore it, perfectly, and make copies for all of us nephews. Mine hangs today over my kitchen table. I was forty years old. My mother told me, Uncle Bobby hated his real name. My middle name is Francis. I never knew. Good stories. Most families have them. Thanks for telling yours. My uncle was a Marine on those same Pacific islands. He went ashore time after time, and somehow lived to tell about it. I spent a summer with him in the 60s - he was a tough man, even then, not averse to shooting first and asking questions later, if at all. He died the next year in a car crash. I would like to have known more about his military career, where he learned what he knew about business, and so on, but he was gone too soon. My wife is Korean and she and I and our baby Sarah appreciate what your Uncle Bobby and his fellow soldiers did for South Korea. I walked some of those hills in Korea. Spoonbill hill, and guardpost Oulette, just south of Panmunjon. But I was lucky. I didn't get shot at. Funny thing. I have a picture of my uncle from WWII. Underneath the tail of B-24. With the big Skull and crossed bombs painted on the stabliizers. And the bare metal fuselage, like your father's plane. I wonder if they met each other. sometimes grieving never quite gets finished and others learn to tiptoe around it-- thank you for sharing.